2012, the 75th Anniversary of George VI's Coronation of 1937. 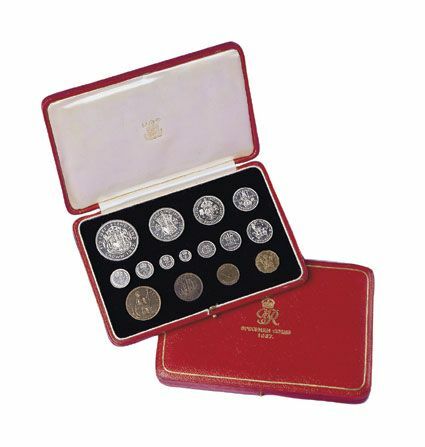 This is a superb set, containing 15 coins all housed in a magnificent official Royal Mint maroon plush case. Seven silver coins, crown to silver threepence plus the silver maundy set of 4d, 3d, 2d and 1d and a further four coins of brass and bronze all in proof condition struck for the Coronation of George VI over 60 years ago. The sets are in proof condition, but of course there will be some toning, pleasant though, on some of the copper coins due to exposure to the air. Very impressive and a great set to own.